Chickpea is valued for its nutritive seed composition which is high in protein content and used increasingly as a substitute for animal protein. High quality seed has the potential to attract premium prices. Hence, the breeding of desirable quality traits, including seed size for desi and kabuli-types, is of major importance. For this, two RIL populations derived from intraspecific crosses of a kabuli-type (S95362; light cream colour) crossed to two desi-types (Howzat and ICC3996; medium tan and dark tan colour, respectively) were assessed across two environments. Fitting of seed size group ratios to inheritance models indicated that seed size is governed by two major complementary genes, where small size is dominant. The low genotype x environment interaction (<6.0% of the total variation for either population) suggests limited environmental influence on this trait. Subsequently, two major quantitative trait loci (QTL) were identified, one on LG 4 (QTL 1) and one on LG 1 (QTL 2), that together accounted for 20% of the seed size trait and may be targeted for future fine mapping and associated selectable marker development. 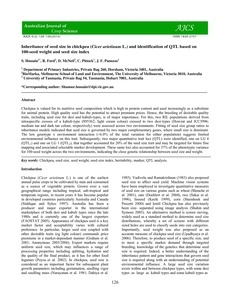 These same loci also accounted for 37% of the phenotypic variance for 100-seed weight across the two environments, indicating the close genetic relationship between seed size and weight.